The newly appointed Ambassador of the USA to the Netherlands was already known as a baseball fan at home, but in his introduction video Timothy Broas expressed his personal interest in the Netherlands, economic ties, sports and in the new baseball stadium in Hoofddorp. In the aftermath of the Netherlands Ambassadors Conference, hosted yearly by the Ministry of Foreign Affairs in The Hague, new Consul General of the Netherlands in San Francisco, Hugo von Meijenfeldt, on one Friday lunched with Amsterdam Mayor, Eberhard van der Laan and visited the new baseball stadium in Hoofddorp. Here, Von Meijenfeldt was accompanied by your Mister Baseball correspondent and welcomed by ETO ball park project manager, Maarten Broersen. The Dutch diplomate from US Westcoast told Mister-Baseball.com, that Mayor Van der Laan had underligned his involvement in the cooperation between Amsterdam and Hoofddorp concerning the promotion of the new highly qualified baseball stadium in Hoofddorp. This current week an economic delegation from Dutch capital Amsterdam, headed by Van der Laan, is visiting USA Eastcoast cities New York and Boston and Westcoast city San Francisco. The three cities happen to be homes for MLB clubs Yankees, Red Sox and Giants, which have militated various Dutch players, such as World Series winners Xander Bogaerts (2013 with Boston) and as a coach Hensley Meulens (2012 with San Francisco). Also Dutch technical director Robert Eenhoorn was given the 1996 World Series ring, because as an infielder he had helped New York Yankees till September on the way to their first World Series victory since 1978. After Bogaerts with his Red Sox, also his compatriots clinched national championship titles last year: Andruw Jones in Japan, Rick van den Hurk in Korea and Randall Simon in Nicaragua. 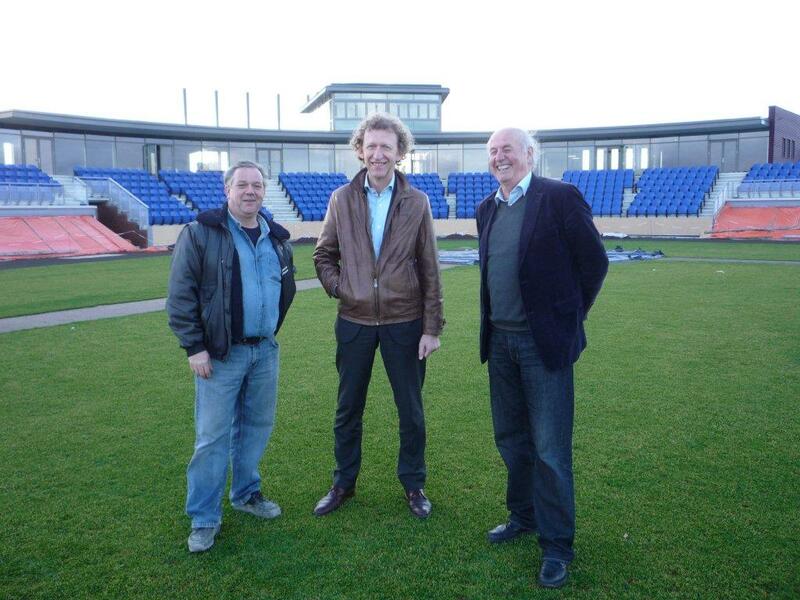 Tomorrow, Thursday April 10, Municipality of Haarlemmermeer will host a press conference in the new baseball stadium of Hoofddorp, which an hour later will be opened officially. The happenings will be attended by MLB representative in Europe Jason Holowaty, Director Market Development. This is a picture showing Netherlands Consul General Hugo von Meijenfeldt (center), ETO projectmanager Maarten Broersen (left) and your correspondent in the Netherlands Pim van Nes.